Crossbar’s device is a silver filament ReRAM with a difference. For one, the silver filaments are in standard silicon dioxide, probably the most common product manufactured in a semiconductor fab. The other main difference is in the way that bits are addressed – the selection device. 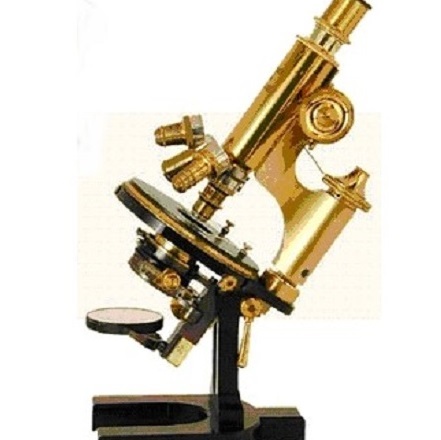 A decided advantage of this technology is that the selection device is built into the cell. Other ReRAMS must use an external selection device, either a diode or transistor, and that can pose problems that The Memory Guy detailed in a prior post. This is an area that has received a lot of research funding but is still a thorny issue for many other technologies. The fact that ferroelectric memory or FeRAM has required a transistor has prevented the technology from shrinking enough to compete against modern NOR. 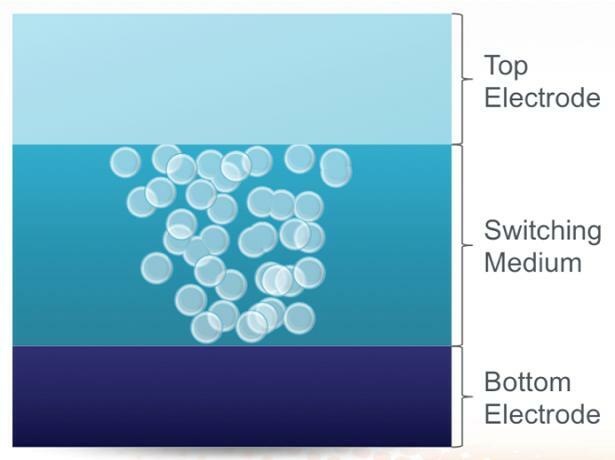 In Crossbar’s case, the connection between the top and bottom electrodes (shown in the diagram) is incomplete even when the cell is programmed. 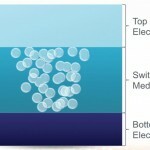 It takes a positive current to create that last layer of silicon atoms that connect the top electrode to the bottom one. When the read current is reversed then that connection does not form, removing the need for a selection device. A stronger current removes more silver atoms, preventing a weak forward current from creating a conductor. The market for alternative technologies is limited – OEMs use the cheapest technology they can get away with, even though other technologies offer significantly better specifications. Silicon will retain its dominance over newer materials for as long as it can, and technologies like Crossbar’s will play a niche role until 3D NAND runs out of steam, which currently looks like it will happen 2-3 generations after 2D runs out of steam, which is 2-3 process generations away from where the market is today. For a deeper explanation of this see The Memory Guy’s earlier post on alternative memories. When that does happen, then there will be a significant shift, and today Crossbar appears to have an important advantage. Does connection never form between top and bottom electrodes? Also, how does the bit selection works? Can you please explain “for dummies”? The way it was told to me, the connection doesn’t fully form until a positive current is applied to the cell, causing the last layer of ions to connect the wordline to the bitline. Once the current is removed then the connection is lost. Effectively it’s a built-in diode, because a reverse current can’t form this last layer. That’s what’s so intriguing about the technology. Your timeline for the introduction of “alternative technologies” like Crossbar’s may be flawed, as you appear to be considering it only as a replacement for NAND flash. But if you consider embedded applications that are impossible using NAND, this timeline could accelerate considerably. Mark, you’re right. NAND chips generally sell for more than a dollar – NAND chip makers try not to make parts that sell for less because they’re unprofitable. NOR and even EEPROM are used to fill these other slots, but they are much smaller markets than the NAND flash market. Alternative technologies can replace EEPROM and NOR more easily than they can replace NAND flash, but this limits the size of their market, which is the point I wanted to make. I agree that embedded applications, many of which use NOR and EEPROM today, could use alternative technologies well before these technologies become cost-competitive with NAND, and that has actually been happening for decades – Ramtron FeRAM has shipped in a number of applications dating as far back as the 1990s. In comparison to the NAND market, though, these markets are very small, and that’s why I said that their market is limited.